Coal Creek Triathlon Club - Get Involved. Make Friends. Enjoy Motherhood. A MOD Moms business. Coal Creek Triathlon club is a family friendly and fully inclusive triathlon club where adults and youth of all ability levels feel welcome and encouraged to reach their full potential. Triathlon may be considered an individual sport on race day, but getting to the start line doesn’t have to be a solo effort. Whether you’re just starting out or you’re a seasoned athlete, Coal Creek Triathlon Club can help you with your training and racing goals. 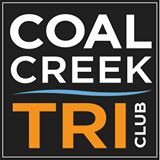 New members are always welcome to join Coal Creek Triathlon Club. We do not require people to participate in an actual triathlon, nor do members have to be triathletes. We encourage multi-sport fitness and invite all interested persons to our meetings and to participate in group workouts. CCTC is hoping that by keeping membership fees low, athletes and families will be more able to participate in triathlon. An important goal for our club is to provide scholarships for underprivileged kids. We could also offer a scholarship to a MOD Mom each year.